May 2, 2011 - EffectiveUI announced the launch of a new interactive website created with Microsoft Corp. for the Navy Flight Demonstration Squadron, the Blue Angels. HTML5 and Microsoft Silverlight deliver an immersive user experience, bringing viewers a Blue Angels air show in a way that's never before been seen except by the pilots. Drawing a Crowd, the Blue Angels website gives the U.S. Navy and Marines the ability to create compelling, effective content that reaches a wide audience at a low cost. EffectiveUI created to showcase naval air power and increase morale among its officers, the U.S. Navy Blue Angels now serve to recruit new service men and women in the Navy and Marine Corps. The Blue Angels collaborated with EffectiveUI and Microsoft to provide a powerful, engaging experience that taps into the excitement of a Blue Angels flight demonstration, but goes a step further to offer a unique perspective on the show itself, previously seen only through the pilot's eyes. The website will allow the Blue Angels to more effectively achieve recruitment goals with a presence that engages and informs 24 hours a day, seven days a week. Prospective recruits, fans and enthusiasts can go in-depth on the organization's history, its team, the operations and the jets themselves. The immersive site also brings them inside the cockpit and gives them control over the aspects of the air show they see and how they see them. "The Blue Angels are excited to launch a new, state-of-the-art website that will allow us to more effectively accomplish our mission of enhancing Navy recruiting and credibly representing Navy and Marine Corps aviation to the United States and its Armed Forces," said LT Katie Kelly, U.S. Navy Blue Angels. When deciding to create a new site, the Blue Angels wanted to capture the intensity of the organization, as well as the precision and accuracy that goes into flying the F/A-18 Hornet and C-130 Hercules. 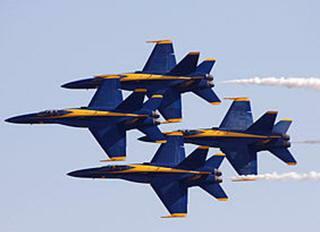 Each year, more than fourteen million spectators watch the Blue Angels perform at air shows across the country. Now, far more can witness their thrilling flight demonstrations from the perspective that, until now, has only been available to the pilots themselves. Since the home page makes the first impression on every visitor regardless of platform or device the team employed HTML5 with dynamic content and social media integrated via ASP.NET, while Canvas and jQuery provided the structure for the site's main navigation. The performance of this content is optimized with Windows Internet Explorer 9, particularly with regard to animating the user interface over a large, high-quality video. Within the site, a section titled "Inside the Demo" includes high resolution, interactive video that brings viewers right into the cockpit with the Blue Angels squadron. The site features footage of the Blue Angels performing 37 different maneuvers, giving viewers an inside perspective of what it's like to be part of this elite demonstration team. Three different camera angles are shown for each maneuver, and users are able to select and switch camera angles in real time. This unique interaction was made possible with Microsoft Silverlight and Internet Information Services (IIS) Smooth Streaming technology. "It's inspiring to see government agencies taking user experience seriously," said Anthony Franco, president, EffectiveUI. "The Blue Angels invoke great emotion through their air shows by successfully translating that experience online and using a wide-encompassing technology, the organization will be able to reach many more people in a truly engaging way."